Like many families, we color eggs each year as a family during Holy Week (the week between Palm Sunday and Easter). 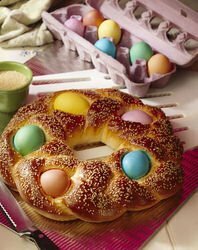 While the kids are busy with the hard-boiled eggs, I dye a dozen raw eggs for another seasonal treat … Easter Bread. This bread is wonderful for Easter Sunday breakfast (or Good Friday supper). Combine flour, sugar, salt and yeast in large bowl. Heat milk and margarine over low heat until warm (120-130 degrees). Add to dry ingredients. Add beaten eggs into dry mixture with milk. Beat 2 minutes. Stir in enough additional flour to make soft dough. Knead 8-10 minutes. Place in a greased bowl, flip to grease top. Cover and let rise until double (1 hour). Punch down. If adding almonds, knead them now. Divide in half and roll each half into 24-inch rope. Twist ropes together loosely, like a candy cane. Form into ring on greased sheet, tucking loose ends under to form ring. Brush with melted butter, then tuck colored eggs into the loop just before baking at 350 for 30-35 minutes. NOTE: We usually make two loaves for two reasons: If they both turn out, we bring one to a friend. If not (and I’ve always had this hang-up with yeast breads, killing the yeast before its time), we eat the one that doesn’t look as though it will break a tooth. After all, Lent (and any associated suffering) is over. It’s time to REJOICE! This entry was posted in Uncategorized and tagged Easter bread, Easter recipes, Good Friday by heidihesssaxton. Bookmark the permalink.